When the girls were first born, the majority of the time we were doing KANGAROO CARE, and it made no sense to not wrap them up. 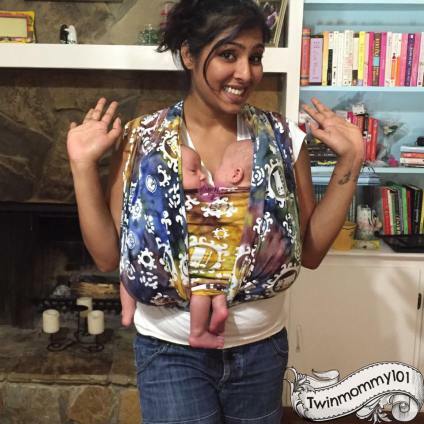 Whether tandem or one at a time, babywearing gave the same effect/feel of having babies laying on my chest but with FREE HANDS!! (nd you can still get some skin to skin action in while wearing!) Mobys/ stretchies are ok with this carry, but just be caution about the stretch in the material and how the weight of your babies can affect the stretch over time. And if you use a woven you will want a size 7+. *if you have premature babies, please consult with your physician before wearing. Thing such as muscle tone, low birth weight, etc can play a factor in safety. When tandem wearing, you can position your babies heads as far apart as they need to be, but be aware that they will more then likely end up head to head! (The girls ALWAYS did this!) Be sure to make sure their airways are open and that they are getting some fresh air (they aren't breathing too much of each other's co2). Also ensure that their spines still have the natural curve.